There is an interesting blog by Jack Caldwell relating to the quality of conference papers and copyright. Basically he argues why would any intelligent person work to produce a nice paper that becomes the property of another, when they can post the same material on their own website for nothing and potentially for greater gain than will come from the loss of that effort in a dusty, forgotten volume from a foreign potentate? I agree with him, and this is why MEI Conferences take the following approach: we ask authors to submit draft papers prior to the conference. These are not refereed- they are essentially discussion documents, but they go into the Proceedings- not a hard copy volume which nobody wants to lug around, but a much more utilitarian CD, which can easily be searched. The authors of the papers have the copyright on their articles, so they are free to do what they wish with them- publish again on the web, at other events, or submit to journals. In fact we encourage authors to edit their drafts after the conference (to take into account conference discussions and criticisms) and then submit the final versions for peer-review in special issues of Minerals Engineering- but whether or not they do so is entirely up to them. Heard today from Russell Heins, formerly with Gekko in South Africa. 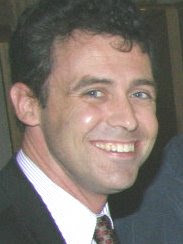 He is still in Johannesburg, and is now Operations Director for Tantalite Resources running the tantalum refinery. Tantalum is one of the few metals whose price has increased significantly over the past 12 months. Jon and I relaxing on the 16th Street Mall, Denver, after a hard day at the SME exhibit. I would say that the number of booths was about the same as in previous years, but fewer people were present to man them. For instance we talked to one major manufacturer who normally has a 40-man presence, this year cut to 20. I cannot comment on the technical presentations at the conference, but I look forward to receiving Fathi Habashi's report in due course. It will be interesting to see how the economy affects next year's event, which will be held in Phoenix, Arizona. Business is booming for Starkey & Associates Inc, Canada, leading designers of SAG mills. Here Alex Montgomery, marketing director, shows off the SAG mill design unit, watched by Jon and Principal Consulting Engineer John Starkey. Angel Serapio Rodriguez-Avello Sanz and Jose Botin of the Universidad Politecnica de Madrid, Spain. Jose is currently a visiting professor at the Colorado School of Mines, and has recently published a book 'Sustainable Management of Mining Operations'. Jon with Chris Bailey. 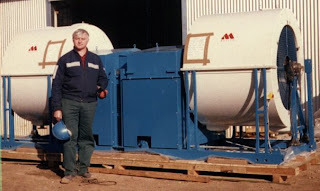 Chris was a student of mine at the Camborne School of Mines in the 70s, and is now managing director of Holman-Wilfley Ltd, a leading manufacturer of shaking tables, based in Cornwall, UK. Randol Gold's Hans von Michaelis shows off his latest head-gear. Hans is on the Executive Advisory Board of Strathmore Minerals Corp., USA. Rob Morrison of JKTech showing the new book "An Introduction to Metal Balancing and Reconcilitation" to Osvaldo Bascur of OSIsoft, USA. Rob has edited this book, which is shortly to be published as a JKMRC monograph. With Prof Guven Onal of Istanbul Technical University, Turkey. Guven was chairman of the 2006 IMPC in Istanbul, and is MEI consultant to next year's Processing of Industrial Minerals '10, the first MEI conference to be held in Turkey. At the Elsevier Science stand, with Richard Tamblyn of Imerys Minerals, UK, Fathi Habashi of Laval University Canada, and Dean Eastbury of Elsevier Science, UK. Fathi is one of the most prolific writers I have ever met, having a number of books on extractive metallurgy and mining history under his belt, as well as writing reviews on conferences and proceedings. Dean is executive publishing manager at Elsevier, and responsible for the 'big 3'- Minerals Engineering, Hydrometallurgy and International Journal of Mineral Processing. At the Xstrata Process Support booth, with Lori Kormos, Norman Lotter and Peter Whittaker. XPS are sponsors of next year's Nickel Processing '10, and there is obvious concern regarding the severely depressed nickel price, which has led to many Canadian mine closures. As Norman observed, one of the major factors which will contribute to a rise in price will be an increase in stainless steel demand, particularly from China. We ate last night at the excellent Ship's Tavern in the Brown Palace Hotel, where we met Eric and Ebba Forssberg again. With the very feeble pound, eating in USA is no longer a cheap affair, but at least the weak pound will favour delegates attending MEI Conferences, especially in UK. After dinner, we watched the Oscar ceremonies on TV. It was good to see the Brits in the forefront, with Kate Winslett as best actress and Slumdog Millionaire sweeping the board. It almost (but not quite) compensated for supporting the English cricket team!! Now killing time before going to the exhibition, which opens at 11am, with lunch between 11.30am and 1pm- strange timings! Have cleaned the camera lens to remove the grease that gave yesterday's photos their soft-focus effect. Jon pictured with Graham Baldwin, Director of Business Development of InfoMine. At the International Mining exhibit with Phil Playle and John Chadwick. One of the largest exhibits was that of FLSmidth Minerals, our sponsors of this year's Physical Separation '09 and Flotation '09. In this photo, I am at the FLSmidth Minerals exhibit, with marketing manager Andrew Cuthbert. Entering the exhibition, the first impression was that there were far fewer people here than in previous years. We then met up with Prof. Cyril O'Connor, current chairman of the IMPC, and Dean of Engineering at the University of Cape Town, with Dr. Rob Dunne, of Newmont Mining, Australia (sponsors of next year's Precious Metals '10), and Dr. Norman Lotter, of Xstrata Process Support, Canada. Norman is MEI Consultant to Nickel Processing '10, which will be held in Falmouth next year. The last time we photographed Cyril and Rob together was in 1991, at the first Minerals Engineering journal editorial board meeting in the Marina Mandarin Hotel, Singapore. In the photograph below, Rob is first on the left and Cyril 3rd from the right. Also on the photograph are Glen Dobby, myself, Prof. Wakamatsu, Terry Veasey, Dave Osborne and Don McKee. Called in at the Denver Convention Centre to register for the exhibition tomorrow. There did not seem to be as many people milling around as in previous years, and no mineral processors (familiar to me) were sighted. It was nice to see my book on prominent display in the bookstore, as it is not an SME publication. The delegate list shows that 3300 people have pre-registered, which considering the nature of things at the moment, seems to be a fairly healthy turnout. Arrived in Denver mid-day and had a quick walk down 16th Street mall, hunting for mineral processors. Spotted a very eminent one, Prof. Eric Forssberg, of Lulea University, Sweden, and his wife Ebba, pictured here with Jon at Starbuck's coffee. As most people will know, Eric is a former chairman of the IMPC. Our ski holiday in Breckenridge is now at an end, and tomorrow we travel to Denver for the SME Annual Meeting. I have to say that skiing in USA is always a pleasure. Apart from excellent snow, the lift attendants are friendly, people talk to you on the lifts, and on the rare occasion when there is a long lift queue (line), everyone behaves in a disciplined fashion. Anyone wanting to experience the opposite should try skiing in France! 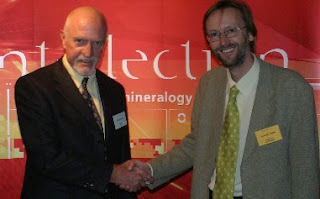 It is less than 3 years since Alan Butcher, Chief Scientific Officer of Intellection, and I shook hands on an agreement to organise annual conferences on Automated Mineralogy in Brisbane. However, shortly after Automated Mineralogy '08, the 3rd conference in the series, Intellection went into receivership, and selected assets were acquired by FEI Company. It has been an interesting couple of months. As you can see, I am now working full-time for FEI, still based in Brisbane; in fact, back at my old (former Intellection) desk, in the same building! Quite an exciting and unique opportunity now exists following much disruption, stress, uncertainty and anguish. By acquiring selected assets of Intellection in December 2008, FEI are now naturally the market leaders in Automated Mineralogy. We are currently working through how to continue with the QEMSCAN brand, the software and philosophy, and at the same time, make the most of FEI's existing and well established (and once competitive) technology and resources, which of course includes the MLA product. Paul Gottlieb and I have been re-hired to make this transition happen, along with Hanna Horsch, and few other ex-Intellection employees. We are officially known as FEI Australia and are less than 10 people. Sadly, many former colleagues were not made offers. I remain very committed (if not more so now!) to growing the world of Automated Mineralogy, both from a business and scientific/engineering perspective. I hope to be able to participate in as many conferences and trade shows as is possible, given the current climate. Obviously, the mining world is in a state of dramatic flux right now but we are blessed that many opportunities for automated mineralogy actually lie outside this sector, in oil and gas for example, where demand for QEMSCAN is as high as ever. The photo above was posted by Chris Shaw of Australia, in Facebook's Minerals Engineers group. It shows Mozley Multi-Gravity Separators (MGS) in operation at the Uley graphite mine, South Australia. There has been some discussion on the MGS, and questions as to whether it is still manufactured, on the MEI Online forum. 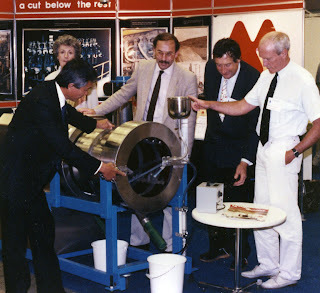 The photograph below shows the launch of the MGS at the 1988 IMPC in Stockholm. With me (right) in the picture are Joan Brookes, Billy Chan, Don Hepburn, and the great man himself, Richard Mozley, who sadly died in 1995. I've had an exchange of emails with a German lady, who would like to attend Physical Separation '09 in June, but is worried about the journey from London to Falmouth. This is understandable as Cornwall is the most remote area of England, but don't be put off by this, as the journey can be a very rewarding experience, and takes you into one of the most beautiful areas of the world. Because of its location in the far south west of Great Britain, Cornwall is the only area of England to have retained its Celtic roots, having survived successive invasions by the Romans, Vikings, Saxons and Normans. Not only is Cornwall remote, but to access it, two very inhospitable moors have to be crossed. First of all, Dartmoor in Devon, the setting for Conan Doyle's "The Hound of the Baskervilles" and home to the famous prison, then the bleak Bodmin Moor in Cornwall, passing the Jamaica Inn, immortalised in Daphne du Maurier's famous novel. Passing over these moors by modern transport, it is easy to underestimate how formidable the journey to and from London must have been little over 150 years ago, when travellers would often make their wills before departing, so dangerous was the journey with the ever-present fear of highway robbers, as well as the elements. In the mid 19th century, the heyday of Cornish tin and copper mining, the most prestigious service was the London to Falmouth Royal Mail Coach which left Falmouth at 1.45am and after travelling through Cornwall via Truro, St Austell, and Liskeard, crossed the river Tamar and headed for an overnight stop at Devonport. Departing the following morning at 9.30am it then passed through Plymouth, Ashburton, Exeter, Honiton, Ilminster and Amesbury that day, departing from Andover at 12.19am the following morning and after another overnight stop, arriving in London at 7.05am, a total journey time of nearly 3 days!! Today the journey time is around 5 hours by car or train and it is easy to overlook how formidable the moors must have been in the past. The various options for travelling to Falmouth are given in the Travel section of each Falmouth-based MEI Conference web-site but I would like to add a few extra tips which may make your journey more comfortable. Assuming you are travelling from London Heathrow, you essentially have two options- car or train. The MEI team have rarely used the air travel option, as the plane to Newquay only operates from London Gatwick, and the transfer to Falmouth is by very expensive taxi, which has to be reserved while on the plane. If you intend to spend some time in Cornwall after the conference, then a car is a necessity. We have a deal with Europcar, so when ordering a car from the airport, please quote our contract number (on the conference website). Train is the second, and often preferred option, and the Paddington to Truro section is one of the world's great rail journeys (see also the posting of 29th January 2015). Book your ticket in advance via the website link. The journey will be in 3 stages- Heathrow to London Paddington; Paddington to Truro and Truro to Falmouth Docks. Make sure that the Paddington departure is at least 2 hours after your flight arrival, to give you plenty of time to pass though immigation, baggage retrieval and customs. After clearing immigration, follow the Trains signs, and hop on the Heathrow Express. This leaves every 15 minutes, and the journey time to Paddington is also 15 minutes. If you have time available get a first flavour of Cornwall by enjoying a pasty at the West Cornwall Pasty company situated on the concourse. The journey from Paddington to Truro is about 4 hours. On arrival at Truro, transfer to the Falmouth train on the adjoining platform, and take the short journey to Falmouth Docks, where you will be met by an MEI representative, who will transfer you to your hotel. Enjoy the journey- we never tire of it!! Only a week from the SME meeting now. If anyone would like to meet up to discuss any aspects of MEI or Minerals Engineering journal, please let me know. Jon and I will be in the exhibit area on Monday only. Breckenridge really is a very pleasant Victorian gold mining town, with some fine restaurants and shops. At an altitude of 2926 metres, it does literally take your breath away!! I would definitely recommend Breckenridge to anyone visiting Denver, and who has a few days to spare. Also highly recommended are the Pine Ridge Condominiums, where we have stayed during our last two visits. Five minutes walk from Main Street, they are also 50 metres from the ski bus stop, and you can ski directly to your door in the evening, the condos being situated on the side of the 'Four O'Clock' run. Abstracts still coming in at this late stage for SRCR '09, which now has a very full programme, highlighting the importance of sustainability at the moment. A great day today, cold, but cloudless sky. Barbara and I are wearing ski helmets for the first time in 19 years of skiing. Pretty sensible as most accidents are caused by other people. If you are not too squeamish, take a look at this, and this. Some accidents are self-inflicted though!! Another very cold (-10C) day, and snowing heavily on the mountain. Slept in a little later this morning- checking email at 5am! Nothing in of real interest. Only skiied for about 3 hours today. Very cold and snowing heavily in afternoon. Checking email at 4.30am this morning (7 hour time difference)! Had emails from Fathi Habashi and Norman Lotter, saying they will be looking out for Jon and me during our 1 day (Monday) at the SME exhibition. In the current economic climate it will be interesting to see who is there (or more importantly who is NOT there). I would think that showing that you are alive and kicking is particularly important at the moment. Talking of the economy, Amanda has posted on MEI Online a link to what looks to be a very interesting article, by John Chadwick in International Mining. He has interviewed representatives from the leading suppliers in the minerals industry, for their views on how the industry will fare in 2009 and 2010. I’ve just been looking at some stats from Elsevier’s ScienceDirect, and see that in 2008 there were 288,845 downloads of papers from Minerals Engineering. Yes, over TWO HUNDRED AND EIGHTY EIGHT THOUSAND, a truly staggering figure. In the same period, International Journal of Mineral Processing had 145,026 and Hydrometallurgy 243,390 downloads. These figures show the enormous usage of these journals in industry and academia, and personally I rate downloads as a much more valuable indication of a journal’s worthiness than the often biased impact factor (see http://www.meionline.proboards2.com/index.cgi?board=general&action=display&thread=1 for a general discussion on impact factors). In looking at these stats, I have to congratulate Kostas Komnitsas and Dimitra Zaharaki of Technical University of Crete, whose paper “Geopolymerisation: A review and prospects for the minerals industry” (Volume 20 Number 14) was the most downloaded Minerals Engineering article in the last quarter of 2008. We hear that the recent Canadian Mineral Processors’ conference in Ottawa had a good turnout of approx 425. The usual numbers are 380-450. According to our Canadian contact the base metal operators are keenly looking for operations efficiency ideas. This bodes well for mineral processing conferences, despite the recession. Other good news is that the AMIRA P9 meeting in November is being arranged in Cape Town, to correspond with MEI’s Flotation ’09 conference. Not really a news item to kick-off this blog, but those of you who are familiar with Falmouth, the venue for many recent MEI Conferences, might like to see how it looked a couple of days ago, albeit for only a few hours. This picture was taken from the field overlooking Falmouth, a popular photo-stop during the MEI Conferences' coastal walk. The photo below is of Gyllingvase Beach, in front of the conference venue, the Falmouth Beach Hotel. Doubtful whether we will get views like this in June for Physical Separation '09!